Difference between revisions of "Ford Freestyle (B562)"
'''Ford Freestyle/Ford Ka Freestyle (B562). 2018 to date (prod. n/a). 5-door saloon. F/F, 1194, 1497 cm³ (I3 DOHC), 1498 cm³ diesel (I4 DOHC).''' 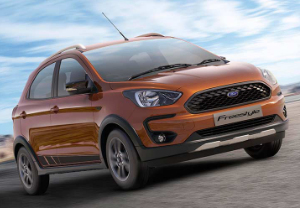 Crossover or ‘compact utility vehicle’ version of Indian-market [[Ford Ka Mk III|Figo]], débuting the Dragon 1·2 triple, and reviving the Freestyle nameplate last seen in the US for the 2007 model year. Good power from new unit, based on larger 1·5, but without a balancer shaft. Five-speed Getrag manual gearbox. Diesel carried over from existing Fords. Essentially the same as the Figo, but with ride height raised 16 mm, and more cladding, and roof rails. Dashboard featured 6·5-inch touchscreen. Ka Freestyle in Brazil, where the 1·5 triple was offered. '''Ford Freestyle/Ford Ka Freestyle (B562). 2018 to date (prod. n/a). 5-door saloon. F/F, 1194, 1497 cm³ (I3 DOHC), 1498 cm³ diesel (I4 DOHC).''' Crossover or ‘compact utility vehicle’ version of Indian-market [[Ford Ka Mk III|Figo]], débuting the Dragon 1·2 triple, and reviving the Freestyle nameplate last seen in the US for the 2007 model year. Good power from new unit, based on larger 1·5, but without a balancer shaft. Five-speed Getrag manual gearbox. Diesel carried over from existing Fords. Essentially the same as the Figo, but with ride height raised 16 mm, more cladding, and roof rails. Dashboard featured 6·5-inch touchscreen. Ka Freestyle in Brazil, where the 1·5 triple was offered. Ford Freestyle/Ford Ka Freestyle (B562). 2018 to date (prod. n/a). 5-door saloon. F/F, 1194, 1497 cm³ (I3 DOHC), 1498 cm³ diesel (I4 DOHC). Crossover or ‘compact utility vehicle’ version of Indian-market Figo, débuting the Dragon 1·2 triple, and reviving the Freestyle nameplate last seen in the US for the 2007 model year. Good power from new unit, based on larger 1·5, but without a balancer shaft. Five-speed Getrag manual gearbox. Diesel carried over from existing Fords. Essentially the same as the Figo, but with ride height raised 16 mm, more cladding, and roof rails. Dashboard featured 6·5-inch touchscreen. Ka Freestyle in Brazil, where the 1·5 triple was offered.